Established in 1998, Taiwan Yun Lin is an experienced heat shrink tubing manufacturer of shrinking tubes. We mainly offer heat shrink tubing such as thin wall polyolefin tubing, adhesive-lined polylefin tubing, high voltage isolation heat shrinking tubing, braided sleeving, and PVC heat shrinking tubes. Our tubes have UL certification and SGS approval, and meet RoHS standard. Yun Lin Electronic Co., Lid is a professional manufacturer and experienced distributor of heat shrinkable material since 1998. Our factory based in both Taiwan and China. Our main factories located at Shenzhen Baoan, Shenzhen Longhua, Guangzhou, Jiangsu.etc.. All of our factories have obtained the certification of ISO9001 and focus on research and development of wire and cable insulation. Our main tubes also have UL certification and SGS approval, and meet RoHS standard. 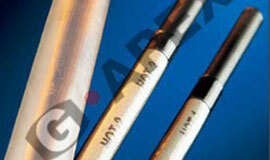 Presently G-Apex tubing is used in a multitude of different applications for wire harnesses and cable assemblies. There are multiple applications in commercial electronics, automotive, military, industrial equipment, truck and marine, aerospace, communication and so on. The complete tubing range is an ideal choice for wire and cable management. G-APEX dedicate to different property of heat shrinkable material for providing satisfactory solution to our customers. properties. Clear tube applies to protect wire and cable markers for providing full inspect ability of each item covered.